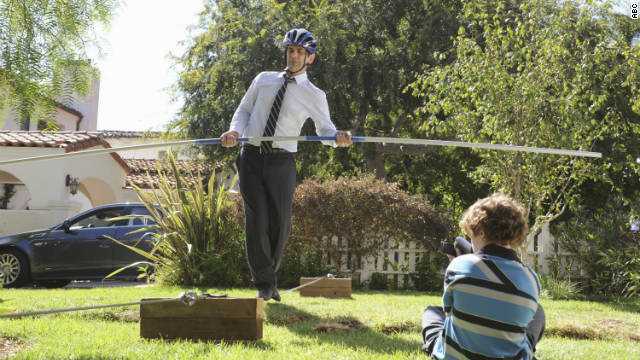 I don't know about you, but I couldn't help but cheer Phil Dunphy as he went across that tightrope on Wednesday night's episode of "Modern Family." Sometimes, these characters surprise you and despite his trademark klutziness with the balancing pole, Phil managed to set a goal for himself and achieve it – jazz shoes and all. The Dunphys needed a win after the day they had. My first co-MVP this week, Claire, got into an epic argument with the school traffic cop after getting a ticket, even to the point of tearing the ticket up and throwing it in her face (Julie Bowen may want to prepare a second Emmy acceptance speech for next year). Meanwhile, Haley and Alex in the same class was indeed the nightmare scenario you might envision: They ended up cutting a deal to cheat and it blew up in their faces. However, that was nothing compared to Mitchell and Cam going on a juice diet. As Mitchell described it, "Let's face it, a well-fed Cam is hardly a model of emotional stability. Deprive him of food, and stage by stage, it's a slow descent into madness." It all culminated at Mitchell's boss' house during an environmental fundraiser, where Mitchell tried to get Cam to cheat on his diet. "Get away from me temptress!" said Cam. "And I never thought I'd call you that in a negative way." Mitchell (my second co-MVP, for this scene alone) fled the party hysterically sobbing about the loss of a sea lion named Snorkels, eventually running out into the ocean. Gloria, meanwhile, had her own breakdown over the fact that Jay coddles their new dog. It was to the point where she was trying to get the canine to eat Jay's shoe. As one might expect, Jay and Manny caught her with the shoe in her mouth. She exploded at Jay, "Are you happy? You have reduced me to a person who eats a shoe!" Of course, Jay ended up compromising, no longer letting the dog sleep in the bed with them... though the old softie couldn't help but check on the dog late at night. Thus ends another exemplary episode of "Modern Family." What was your favorite scene? It was certainly tough for me to choose. Post an iReport or comment below. I loved it when they showed the dog in the shower and the look on Gloria's face when she noticed. I love smelling babies used diapers. I demand representations of furries on tv. Where's the inclusion? gay shows on tv. thank g** i dont have kids to have to explain what's wrong with the picture. keep your business behind closed doors. nobody wants to see you sucking face and any nasty stuff you do. More liberal tripe. Why has this not been cancelled yet? Funny how the gay and lesbian folk don't endorse this show much... You have a portrayed gay couple who care about each other, are good parents and are more or less normal as human beings, yet because they aren't sucking face on screen the gays say "I am disappoint". Um......what are you on? Modern Family is VERY accepted AND embraced by the gay community...a large portion of the LGBT community watches and supports Modern Family. I'm very confused as to how you came to your conclusion, unless you spent 1 second looking it up before saying something...which is probably the case. The gay community LOVED how Modern Family handled the gay kiss, believe it or not, most of us don't really dig people making out [straight or gay] on screen, most often it's pointless. Modern Family had a gay kiss, and it was very downplayed and natural....and the gay community APPLAUDED Modern Family for doing so, we don't want to make it a big deal....because it isn't one. Please do some research before spouting off statements that are horribly inaccurate. the part where cam was in the kitchen...hit his head...and ripped the cupboard door off...almost had me choking on my dinner...lmao!!! luv luv LUVED THIS EPISODE!!! I loved when Claire told Haley not to worry that she will have high school to herself again in a couple of years. Gloria telling Jay where she comes from it wife first, mistress second and dog third. The scene with Julie Bowen and the female traffic cop was the funniest, especially when she was trying to lecture Haley and Alex while handcuffed for her own transgression. Hilarious! I love this show but it needs more gay pedophiles.